The above topic came to mind when I received some insightful comments from Michie, who is no longer a corset waist-training “newbie” (as I told her today!). 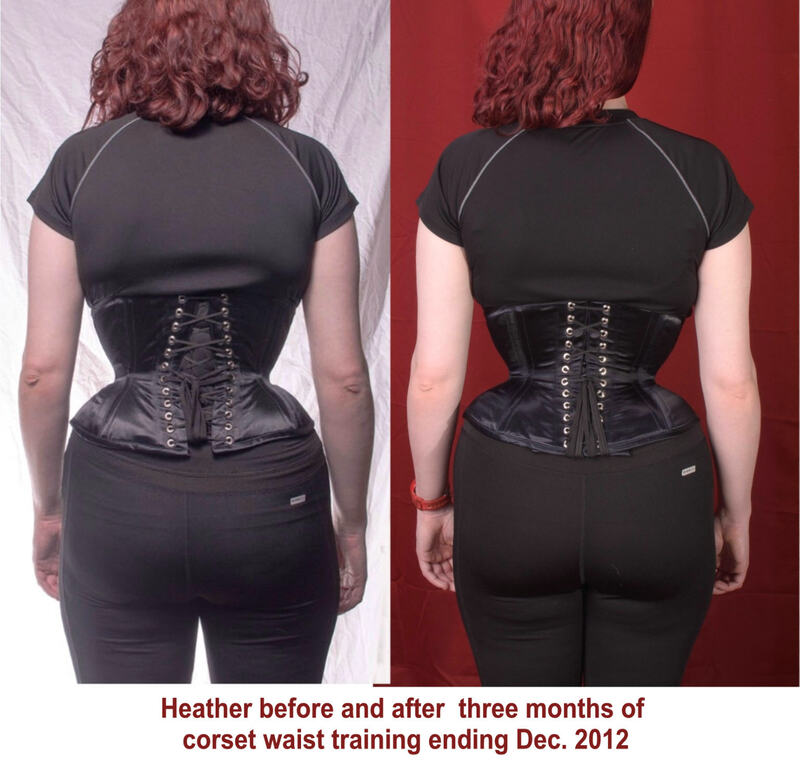 She’s made remarkable progress in waist training using the slow, gradual and recommended way. She’s about to order her second, smaller waist-training custom corset, and I’m very proud of her! –“I was sitting around last night and started thinking about a few of the things that I have done to get me through waist training and a few things were a bit funny, so I thought that I would share. **Sticking to it and not panicking and remembering to breathe (sometimes when you initially think “Ugh!!! THIS is painful!! !” Sit, be quiet, and breathe or do something to take your mind off of the minor owwie, next thing you know, it’s gone!!! –This is not common, but I have had one student mention that about the third or fourth week of training her lower ribs became sore during wear and after removing the corset. Most likely this reflected certain movement in the ligaments connecting the ribs, if not the ribs themselve,s but rib movement occurring this early is not likely. I urged that if she were not at that pain scale level of a 6 or 7 from 1 to 10, to perservere in her daily wearing plan and not take the corset off or loosen up, but for three days try taking two ibuprofen tablets every four hours. I’ve heard it said that one could tolerate a week of four of these pills per four hours. She tried the more moderate approach and her rib soreness diminished in a few days. Of course, we can’t tell if that was helped by the medicine, or perserverance. –The sideways modesty panel was an original idea of Michie, to try to pad the corset out more around her midriff. She tried this when she noted a small irritated or red spot toward her back waistline, surely the result of her long, continuous hours of tightening down gradually. Pressure on the skin can cause a bruise-like mark to appear and/or persist. The proper response is most likely to remove the corset, or loosen it up considerably to let the circulation flow and the mark calm down. We’ll let you know Michie’s result with this technique. Incidentally, there’s nothing preventing you from wearing two modesty panels, one on top of the other. –The three-ribbon lacing idea ca e to me from an experienced corset-wearer some years ago. Sometimes you just need to adjust the top of the corset separately from the bottom and midriff, in order to continue training and for comfort. In Michie’s case, we determined she needed to open up the top and bottom edge more than the waistline where she was achieving more remarkable lacing down than we had expected. She installed three sets of laces and now can leave the top and bottom open more, while pulling snugly on the middle set to close down the waistline. Pictures sent to me from Michie’s home in New Zealand, showed me that this addressed her immediate problem. –Are there any ways you use to get over your own corset-wearing resistances?